In this fact sheet, students will read about who built the first Globe theatre, where it was located and what shows were performed in it. Many of Shakespeare’s plays were first performed at the Globe, although his plays were performed at other theatres and many playwrights wrote for the Globe. Who built the first Globe? The first Globe was built by the company Shakespeare was in – the Lord Chamberlain’s Men. Richard Burbage was the company’s leading actor. They had played at the Theatre, built by the Burbage family on land leased from a Mr Allen. In 1597, Allen refused to renew the lease. However the Burbages owned the Theatre because the lease said they owned anything built on the land. They took it down while Allen was away over Christmas. Their builder stored it in his yard on the north bank of the Thames. The Burbages could not afford to lease a new theatre site. So they offered five of the company, including Shakespeare, the chance to become part-owners of the new theatre for £10 each. With this money they leased land on the south bank of the River Thames, near the Rose theatre. When and where was the Globe built? The builder who stored the timbers of the Theatre was Peter Streete. 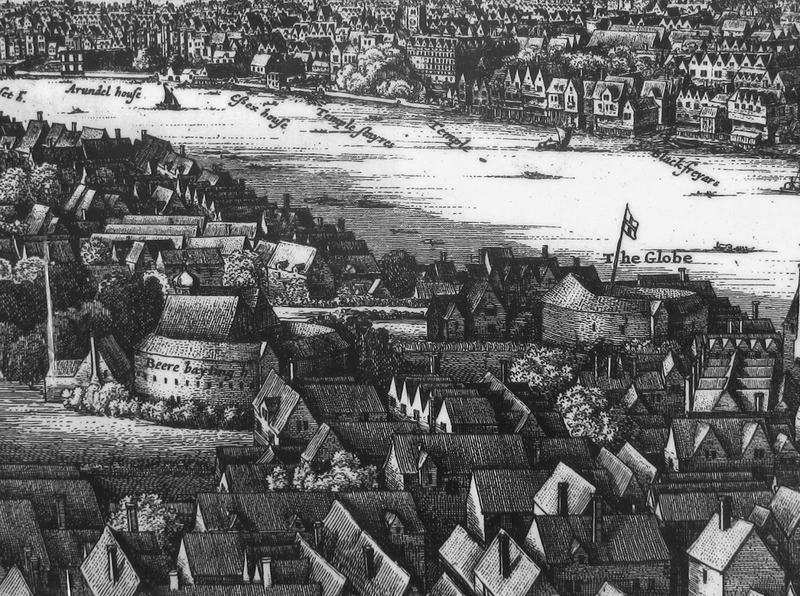 Once the weather was better Streete took the timber across the Thames, to Southwark, and used them to build the Globe theatre. Southwark was a good place for the new theatre. It was outside the control of the city officials (who were hostile to theatres). People already went there to be entertained. It had two theatres (the Rose and the Swan), animal baiting arenas, taverns and brothels. Streete and his workmen built a brick base for the theatre. The walls were made from big timber frames, filled with smaller slats of wood covered with plaster that had cow hair in it. Because the owners were struggling for money, they used the cheapest options in the building process. For example, the roof of the theatre was thatched with reeds, not covered with more expensive tile. In 1599 the theatre opened and was a huge success. This engraving of Bankside, made in 1644, shows the tiled roof and large tiring house and stage roof (like an upside-down W) of the second Globe. In this picture the labels were swapped around. The Globe is actually on the left and the baiting arena on the right. What plays were performed at the Globe? Probably the first Shakespeare play to be performed at the Globe was Julius Caesar, in 1599. Some other Shakespeare plays first performed there are: As You Like It; Hamlet; Measure for Measure; Othello; King Lear; Macbeth and Antony and Cleopatra. Other playwrights wrote for the Globe, including Ben Jonson, Thomas Dekker and John Fletcher. What happened to the first Globe? Disaster struck the Globe in 1613. On 29 June, at a performance of Shakespeare’s Henry VIII, some small cannons were fired. They didn’t use cannon balls, but they did use gunpowder held down by wadding. A piece of burning wadding set fire to the thatch. The theatre burned down in about an hour. It was big news. By the next day two different songs had been printed about it. The company built a second Globe on the brick foundations of the first. It was the same size and shape, but was much more extravagantly decorated; the company could now afford it. It also had a tiled roof, not a thatched one. Fortunately, no-one was harmed when the first Globe burned down. A man’s breeches caught fire, but a bystander put the flames out with his bottle of beer! 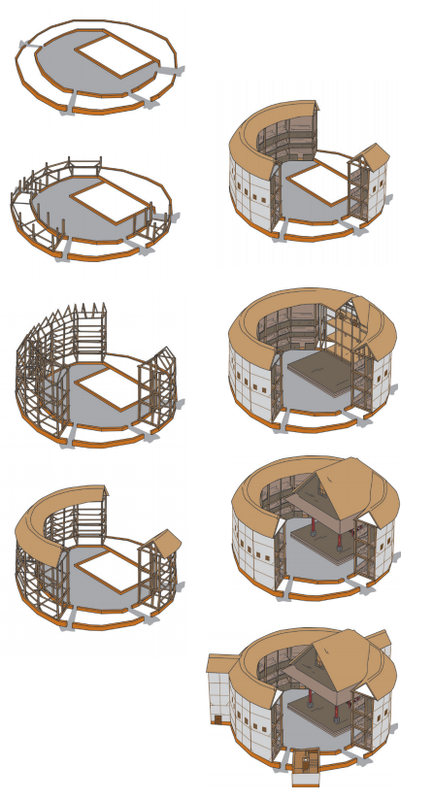 The stages of the Globe being built, from brick foundations and the wooden frame, to the roof being thatched and the walls plastered.